Now available! 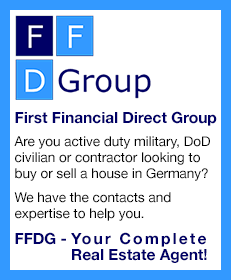 The new Getting Around digital issue for the Kaiserslautern Military Community. 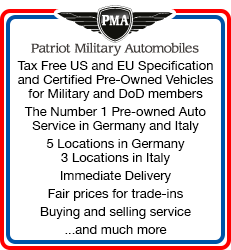 Information on installations, services and facilities. Extensive telephone listings. Click here for download information. From sand and surf to verdant jungle and ancient temples, the Kingdom of Thailand has something for everyone. It's a Southeast Asian, predominantly Buddhist, kingdom almost equidistant between India and China. For centuries known by outsiders as Siam, Thailand has been something of a Southeast Asian migratory, cultural and religious crossroads. In the mountainous north, elephants work forests and winter temperatures are sufficiently cool to permit cultivation of temperate fruits such as strawberries and peaches. But much of the rest of the country is hot and tropical. East meets west in the capital city of Bangkok. Beautiful temples, floating markets, traditional festivals and Thai hospitality are combined with an ultra modern transport system, top class hotels, fantastic restaurants (seafood), nightlife, bars and good shopping at very low prices. A wall and fortress defenses originally protected the city, and some of the forts can still be seen. Most of the major sights, such as the Grand Palace, Wat Po temple and the National Museum, are located in the old royal precinct. The Thai unit of currency is the baht, which is worth a little less than 3 U.S. cents. One U.S. dollar is approximately 37 baht. There are 100 satangs in 1 baht. Notes are issued in denominations of 1000 (gray), 500 (purple), 100 (red), 50 (blue), 20 (green), and 10 (brown). There are five coins: 10, 5 and 1 baht coin, and 50 and 25 satang. Traditionally, Thais greet each other with a wai (by pressing the palms together at the chest). If someone wais you, you should wai back. 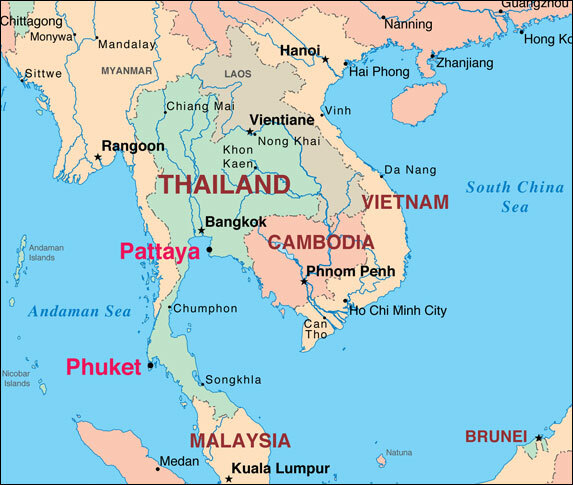 The two main ports of call for the U.S. Navy in Thailand are Pattaya, only about 50 miles from Bangkok, and Phuket Island in the south, 500 miles from Bangkok. Pattaya is on Pattaya Bay on the east side of the Gulf of Thailand. There is no commercial or military port there. U.S. Navy ships anchor in outer Pattaya Bay and liberty parties are ferried to and from shore by local commercial boats, which normally make the run in 15 to 18 minutes. Liberty parties of up to 10,000 personnel can be accommodated at Pattaya. Pattaya, formerly a small fishing village, has become a major tourist resort. It has an Elephant Village where the big animals play basketball, a Tiger Zoo, a Crocodile Farm, a vast tropical garden and a Mini Siam village, with many models of the country's noted structures. It has a fine variety of seaside attractions, including swimming, visiting islands, sailing, snorkeling and scuba diving. There are also many seaside restaurants where the food, especially the seafood, is great. Those looking for peace and quiet could head for nearby Jomtien, which more than makes up for the hustle and bustle of Pattaya. Tours to nearby islands, beaches and sightseeing points abound. In addition, there is a full-range of activities for sports enthusiasts - shooting, bowling and great golfing. The visitor here will never have time heavy on his hands. The island of Phuket, one of many islands off Thailand's west coast, is the anchorage used by U.S. Navy ships during the winter season (November through April). It can accommodate liberty parties up to 3,000 personnel. Because of this relatively small number, aircraft carriers do not visit Phuket for liberty purposes. As a comparison, Pattaya can accommodate liberty parties of up to 10,000 personnel. Phuket (the name means "Crystal Mountain" in Maylaysian) has no commercial or military port on its west side. U.S. Navy ships anchor in outer Patong Bay. Liberty parties are ferried to and from the Fleet Landing by locally chartered watercraft. The terrain on Phuket is varied, with high mountains, rocky headlands, long sandy beaches, tropical vegetation and rubber plantations. It was hard hit by the 2004 tsunami, but remains famous for swimming, offshore dive sites and sailing opportunities. The best beaches are on the west coast, facing the Andaman Sea, with fine sands and clear water. Patong and Kata/Karon are the most popular, thanks also to numerous resort hotels, restaurants and nightlife. The west coast is also home to many dive companies which arrange expeditions to a wide variety of offshore diving areas, including the Surin, Similan and Racha island groups that are known for their colorful corals, clear waters and myriad sea creatures. Phuket is also a regional center for yachting. Other activities include sea canoeing among the rock formations and windsurfing. 11 hours ahead of East Coast U.S.